This elegant and easy main dish recipe for Chicken and Bacon in Puff Pastry serves six people for very little money. If you're feeling flush, add some fresh herbs to the recipe. 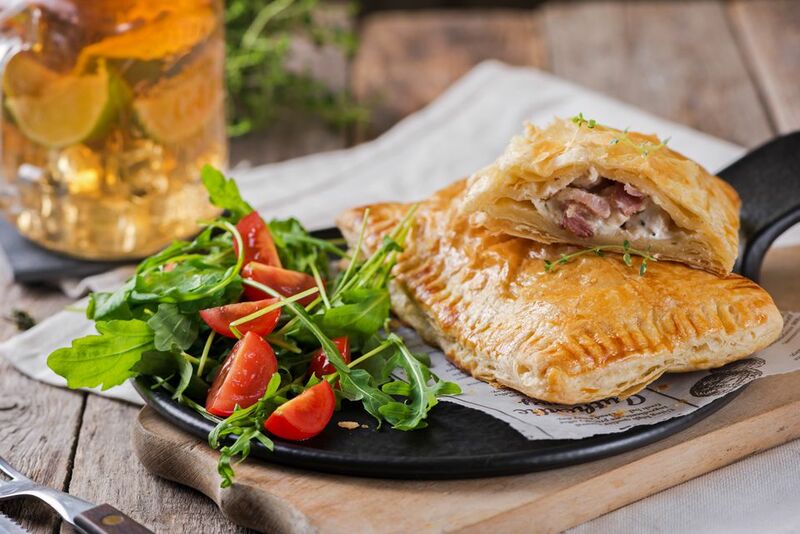 The combination of bacon, chicken, onion, and cream cheese in flaky frozen puff pastry is really wonderful and perfect for company, yet it's so easy to make! You can make the filling ahead of time, then assemble the little bundles just before you're ready to eat. If you have any on hand, use leftover cooked chopped chicken instead of cooking the chicken in the bacon drippings. Just cook the onion in the drippings, and combine all of the filling ingredients, and then proceed as directed. Serve this easy recipe with some peas drizzled with butter, a green salad tossed with sliced mushrooms and cherry tomatoes, and some iced tea. For dessert, an apple pie would be the perfect finishing touch. In a medium skillet, cook the bacon until crisp. Remove the bacon from the pan, drain on paper towels, crumble, and set aside. Drain the pan; do not wipe out. Add the olive oil to the pan and add the chicken and onion. Cook together until the onion is tender and the chicken is no longer pink, about 7 to 8 minutes. Remove the chicken and onion from the pan with a slotted spoon to a medium bowl. Add the cream cheese and bacon to the chicken mixture, along with the thyme and mix well; if you're adding fresh herbs, add them at this point. Gently roll out each puff pastry sheet across the fold lines to make it a bit wider. Cut each sheet into thirds following the fold lines of the pastry. Then cut in half across the strips to make six rectangles from each sheet. Put 1/3 to 1/2 cup of the chicken mixture in the center of each of six of the rectangles. Top with the other six rectangles and gently stretch the top rectangles to fit. Seal the pastry edges and press with a fork. Place each filled rectangle on a cookie sheet and brush with the beaten egg. Bake for 20 to 25 minutes until the pastry is deep golden brown. Remove the pastries to a wire rack and let cool for 5 minutes before serving; the filling is very hot!